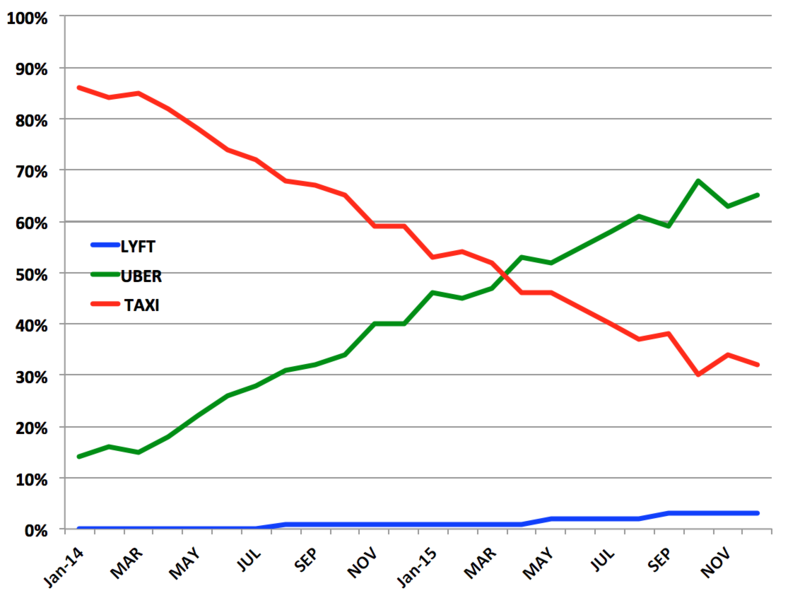 Taxis and car rentals continue to suffer as Uber, Lyft and others take market share at accelerating rates. Ridesharing start-ups like Uber and Lyft are continuing to change the way people travel, according to the latest data. The rising popularity of ridesharing among business travelers accelerated in the fourth quarter of 2015, according to expense-management software company Certify, overtaking rental cars as the number one transportation mode for the first time, and continuing to distance itself from taxis. So-called transportation network companies, including Uber and Lyft, increased share of ground transportation mode among business travelers to 41% from 34% sequentially, while rental car and taxi use fell five and two percentage points, respectively. Taxis have now fallen to a 20% share of U.S. business travelers' use among Certify clients from 37% in the first quarter of 2014. 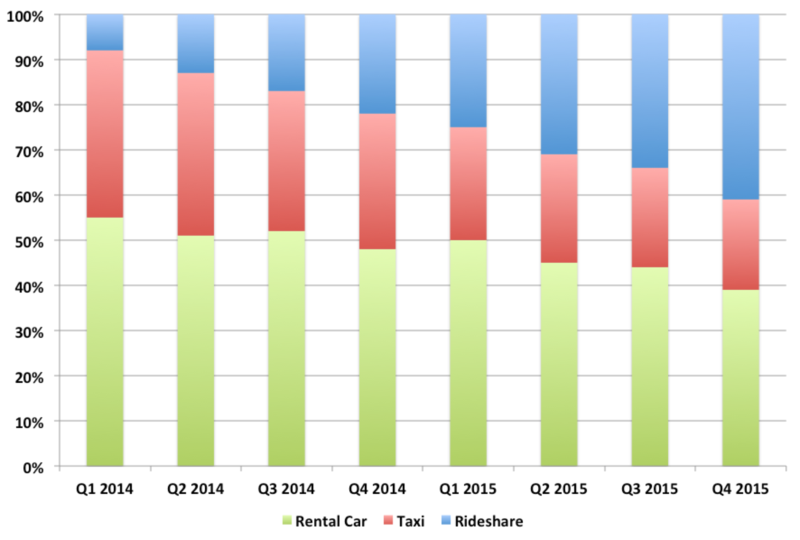 Ridesharing has grown from 8% to 41% (see chart below) over the same period. Uber's U.S. share measured against taxis alone increased from 59% in the third quarter to 65% in the fourth, while Lyft went from 2% to 3%. By city, Uber's growth was most spectacular in the last twelve months among business travelers in Miami (+212%), Chicago (+147%) and New York City (+76%). All data courtesy of Certify. This article is commentary by an independent contributor. At the time of publication, the author held a short position in taxi medallion lender TAXI.